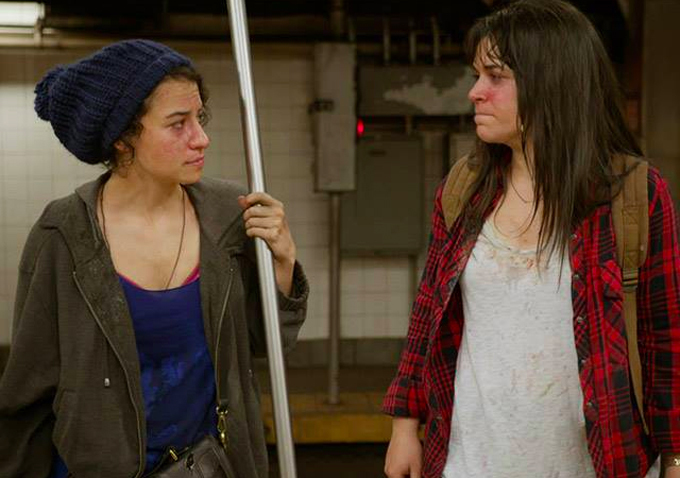 On its surface, Comedy Central’s “Broad City” isn’t an easy sell. Created by comedians Abbi Jacobson and Ilana Glazer, two Upright Citizens Brigade Theatre alums who managed to turn their web series into a television one, “Broad City” is mainly about being young and broke and not giving a damn, which is general and not unexplored territory. The show has the occasional guest star — Fred Armisen, Rachel Dratch and Janeane Garofalo have all turned up in the four episodes that have aired so far — and it has the approval of Amy Poehler, who’s the executive producer, but the focus is primarily on newcomers Glazer and Jacobson as exaggerated versions of themselves, with Hannibal Buress as Ilana’s dentist fuckbuddy Lincoln and John Gemberling as Bevers, Abbi’s roommate’s freeloading boyfriend. 1. Living in the same city but separated by a boroughs-spanning subway ride, Abbi and Ilana spend a lot of time on video chat (though in a mark of true friendship, Ilana is game to travel all the way to Abbi’s house to smoke her up when the G train isn’t even running). The video below is actually the opening scene of the series, and establishes both Abbi’s fondness for routines and Ilana’s boundary-freeness, as well as the show’s notably female bawdiness. 2. More on the differing days of Abbi, who works at a SoulCycle-ish gym as a cleaner but yearns to teach classes (despite having no clear affinity for athleticism) and Ilana, who mostly avoids work at a Groupon-esque start-up with a boss (Chris Gethard) too meek to fire her. Neither is particularly fulfilling as far as employment goes — which is why you have to rely on your pals for uplift. 3. Hannibal Buress, an excellent stand-up who’s also put his impressive deadpan to use as the sidekick on Adult Swim’s “The Eric Andre Show” pines after the noncommittal Ilana with an amusing lack of expression. He matches up nicely with the meandering stoner comedy of the two leads, as in this scene in which he declares which celebrity one of the dogs Ilana’s walking looks like. 4. In a storyline in this week’s episode, “The Lockout,” that recalled one of the finest moments in “It’s Always Sunny in Philadelphia,” Abbi and Ilana get locked out of their apartments for various reasons and make a rapid descent into homelessness that involves accidentally breaking into a neighbor’s place, getting maced and being made to do parkour. The latter scene, which features Jacobson in an impressive bit of physical comedy, isn’t online, nor is another scene in “Pu$$Y Weed” which she rolls out of a room like a tumbleweed, but this one does feature a decent subway pratfall. 5. “Broad City” can have moments of New York specificity that do read a little narrow, but the sequence from “Working Girls,” below, in which Abbi travels to a shipping center on the (real but actually uninhabited) North Brother Island to retrieve a package she missed has some “Louie”-style surrealism to it, from the spooky train ride to the old woman sitting along in the cavernous warehouse eating yoghurt.